The example analysed throughout the wiki section can be downloaded from here: LS3 multilingual survey sample. Unzip it and import the .lss file into your LimeSurvey instance. The default language of the survey is the one you selected in the base language field. By default, it is the language configured in the global settings of your instance. To check which language is the base one, access the general survey settings panel and look for the base language field. In our example, the base language is "English". To start adding new languages in which you wish to translate the survey into, see the additional languages field. In our example, three other languages have been selected: French, German, and Italian. Once done, do not forget to click on the "Save" button located in the upper right side of the screen. Click on any of them and start translating the question field. The first option, translate to, gives you the possibility to select the language you wish to translate into from your base language. To translate them, please access each option and follow the steps described in the previous wiki subsection. Once you are done translating these fields, do not forget to click on the "Save" button located in the upper right part of the panel. Two language switcher can be observed once the welcome page is loaded. LimeSurvey offers the possibility to your respondents to change the language of instructions even though you shared with them the corresponding link for a specific language. 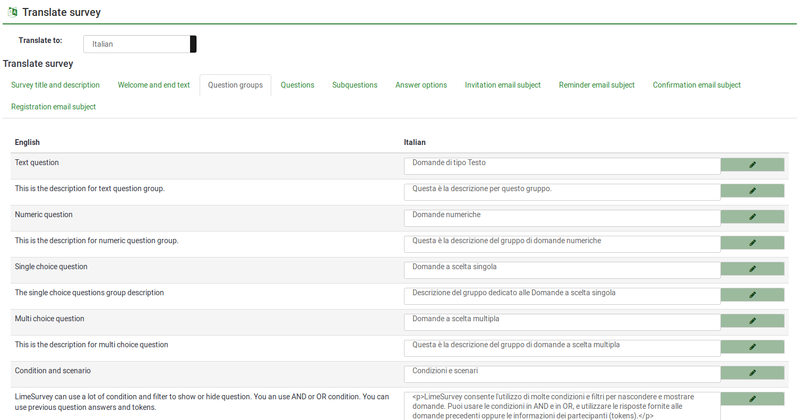 A language switcher will also be located on the top right-side of your survey. In the case in which you wish to hide the two "language switcher" buttons, edit the theme of your survey. For more details, see the hints & tips wiki subsection. In the case in which a string is not translated, the respective string will be displayed in the base language of your survey. If you wish to grant users translation permissions to access the quick-translation tool, check the following wiki subsection. However, in certain scenarios you wish to hide the respective option. There are many ways in which you can hide the language switcher. The "twig" way is displayed below. LimeSurvey does not allow you to edit the standard themes! If you wish to add changes to a standard theme, click on the Extend button located on the top bar to create an editable copy of it. Look on the left side of the screen for the language_changer.twig file. Click on "Copy to local theme and save changes". This page was last edited on 26 March 2019, at 17:11.